When it comes to bow mount trolling motors, Minn Kota is one of the most trusted and popular brands on the market. The Minn Kota Terrova represents some of their most cutting-edge technology. The question is, does this technology translate to functionality on the water? And as with any trolling motor, is it rugged and reliable? Does it give you a stealthy approach for a day on the water? These are all questions we are going to answer. In this article, we are going to take an in-depth look at the Terrova. We will break down the model options as well as the many features and discuss how they translate to use on the water. Here at Fishing Tech, we give the Minn Kota Terrova an A+ rating, and we hope to present a review that makes clear our reasoning and show what makes this a serious choice for serious anglers. The Minn Kota Terrova has a ton of features that have been built into the motor. These range from features in the hardware and build of the motor itself that improve functionality on the water to software designed to increase the versatility and hands-off approach to using bow mount trolling motors. Below, we have listed the main features of the Terrova with brief descriptions. The lift assist is a new design to Minn Kota motors and is featured on the Terrova. This mechanism uses a nitrogen gas cylinder that greatly reduces the amount of force required when stowing the trolling motor. The stow and deploy mechanism on the Terrova makes initiating the movement of the trolling motor from stow to deploy positions so much simpler. As the name implies, a simple lever that is located at the base of the trolling motor can be depressed with a single hand and foot and makes transitioning between in the water and on the boat quick. I-Pilot has been around for ten years now and has become the standard for GPS control of your trolling motor. Motors with i-Pilot come with a wide LCD screen remote for controlling the i-Pilot features such as Spot-Lock, advanced auto-pilot, track recording, and cruise control. Other models of the Terrova come with an i-Pilot link. These motors are blue tooth accessible and allow you to control the i-Pilot features through your Humminbird fish finder or the new touchscreen remote. 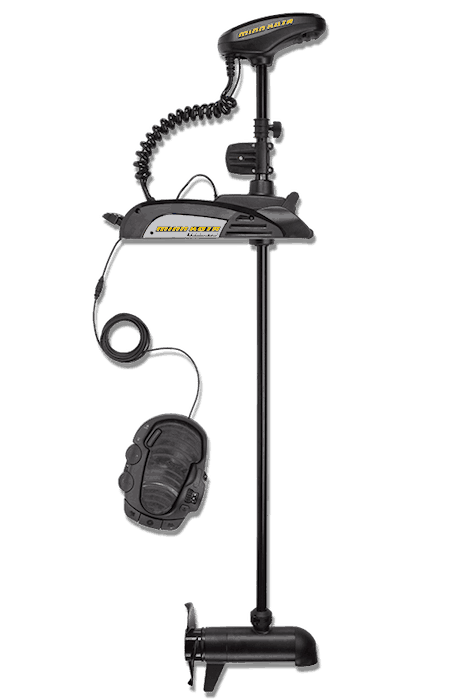 Minn Kota has updated one of their most popular GPS control features, the Spot-Lock. The new system allows you to GPS anchor your vessel and holds it more accurately and in stronger currents. The new JOG technology associated with the Spot-Lock allows you to reposition your anchor in five-foot increments in any direction. AutoPilot is an i-Pilot feature, so it is available on all i-Pilot models. There is one model where the AutoPilot feature is available but not the entire i-Pilot arsenal. It is an alternative, but not a substitute for the i-Pilot software. With AutoPilot, you can lock in your current direction and heading and allow the trolling motor to do the work while you turn your attention to other tasks. Some models of the Terrova feature an integrated Universal Sonar 2. This already installed transducer provides dual beam technology (200 and 83kHz) along with a thermometer for reading water temperature. This transducer is compatible with most major fishfinder brands. A small but extremely useful feature, the push to test battery meter allows you instant visual indication of the amount of battery life left with LED lights that allow use in all light settings. All models of the Terrova come with the Weedless Wedge 2 Prop. This prop design features a flared blade design and swept back tips. This design allows the blades to glide through underwater vegetation rather than use brute force to cut through it. The video below gives a better visualization of some of these features, especially the foot pedal in its design and the number of features you can control with it. There are a few other pieces of equipment that are available for purchase that is not included with the trolling motor. We have listed some of these accessory parts below. MK 460PC: On board marine battery charger. It contains four banks, 15 amps per bank with 60 amps total output. MK 345PC: On board marine battery charger. It contains three banks, 15 amps per bank with 45 amps total output. MK 230PC: On board marine battery charger. It contains two banks, 15 amps per bank with 30 amps total output. Bluetooth Micro-Remote: A smaller and more stripped down remote used to control i-Pilot and other trolling motor features. MKA-16-03 Quick Release Bracket: An aluminum sliding-style bracket for the Terrova and other models. MKR-US2-8 Universal Sonar 2 Adapter Cable: This cable is needed to connect your Humminbird fishfinder with the US2 integrated sonar. For the Terrova, there are quite a few model options that are available. Enough options that we decided to do a quick model breakdown so that you have a clear understanding of what you are deciding between. The biggest differences between these models are the use of integrated sonar, i-Pilot availability, autopilot feature, thrust metrics, and shaft length. Below we have listed the available models. There are some standard features that are going to be found on all models of the Terrova. These include the digital maximizer speed control, lift assist technology, stow and deploy lever, the Terrova foot pedal (on all but the Terrova 55lb i-Pilot model), push to test battery meter, Weedless Wedge 2 prop, and the composite shaft covered by a lifetime warranty. With all of these features still included, your decision only relies on the size and power needed as well as the software options. You can have all of the features and software options but if the trolling motor cannot stand up to normal wear and tear it doesn’t do you any good. The Minn Kota Terrova uses an aluminum and high impact resistant composite material on their mount giving you an incredible base for your trolling motor. The mount is going to take up a fair amount of room, but you are dealing with a larger trolling motor. To use this motor effectively, you're going to need a dedicated bass boat or something with that size bow. Moving on from the mount, we have the composite shaft that is covered by a lifetime warranty from Minn Kota. The shaft can take a tremendous amount of pressure without breaking. It does this by giving in slightly to the applied pressure. This gives the shaft a bend but not break characteristic. While it does have some give to it, it is highly resistant to warping that occurs when other materials, such as lighter metals are used. Other parts of the motor, such as the prop and motor head, are made from a high impact composite material, it's not the same as the shaft material, but it is still highly resistant to flex and warp. When you start dealing with trolling motors in the 80 and 112lb thrust range, stowing and deploying can become a chore for a lot of people. The Terrova uses some ingenious designs that makes stowing and deploying this motor simple. The first feature that aids stowing, in particular, is the lift assist. This gas operated spring greatly reduces the amount of energy needed to lift the larger trolling motor out of the water. For the 80 and 112lb thrust models, this feature is going to be a lifesaver for a lot of people. Even those in their youth will appreciate the Terrova's lift assist when stowing and deploying over and over during a day on the water. It also helps control the descent of the motor when you are deploying the motor for use. You also have the stow and deploy lever that can be pressed easily to engage the motor in deploying or stowing. It seems to make the process feel a bit smoother than simply using a pull handle to engage and disengage the motor. The biggest feature of the Terrova is the i-Pilot navigation system and is probably what most people are interested in. The i-Pilot was introduced in 2010, and while it was initially suspect in a lot of anglers minds, it has since become one of the most trusted and sought-after trolling motor navigation systems. There are two i-Pilot options depending on the model of the Terrova. The first is the i-Pilot link. These models are Bluetooth enabled and can sync with your Humminbird fishfinder. The second is the general i-Pilot. Models with the i-Pilot come with a compact, durable, and water-resistant remote. The remote has been redesigned and comes with a much larger LCD screen and its self-intuitive in its control though it does come with a user's manual and we have also written an in-depth review of the i-Pilot if you want some more detail. We like the remote that comes with the i-Pilot because it allows you to carry control of the trolling motor with you anywhere on the boat as it is light enough to easily wear on a lanyard and small enough to fit in your pocket. It is water and resistant, and it floats so you don't have to be as skittish with it while you are on the water, though repeated dunking can cause some malfunctions in the remote over time. Regardless of if you get the i-Pilot or i-Pilot link, you have access to some cool features. One such is the Spot-Lock which is a GPS anchor. By locking in your position, the trolling motor will keep you within a small radius. The video below gives you an idea of the accuracy of the Spot-Lock technology that is found with the i-Pilot. While the spot-lock is an awesome feature, the water you are in is going to effect the ability of the motor to stay in position. And though it might keep you in position, heavy currents and very choppy water are going to cause the motor to pull more power to remain in position. Overall though, the Spot-Lock is extremely accurate. Going along with the Spot-Lock is the JOG function. This allows you to move your Spot-Lock positioning five feet in any direction. We like this function for readjusting quickly to moving schools or to readjust your position to get a better angle at structures without having to manually reposition the boat. The other major feature of the i-Pilot software is the i-Tracks. This allows you to save up to 16 different routes that you can plug into your remote or Humminbird and have instant access to. If you have a successful run along a shelf line or a specific shore, the i-Track allows you to retrace that specific route. There are other features of the i-Pilot including cruise control and auto-pilot which locks the boat into a specific heading and maintains your desired speed. Overall, the Minn Kota i-Pilot technology provides a new world in fishing technology letting you focus more on the presentation and fighting fish rather than dealing with the motor. We are also going to include the Universal Sonar in this section. The US2 models come with a transducer integrated into the motor head. This transducer features dual beam technology which uses a 200kHz and 83kHz to give you sharper picture of bottom structure as well as a wider look at your surroundings. It's not the greatest sonar that is on the market, but if you don't have a sonar/fish finder outfit that you like or are in the market, this is a convenient deal. The Terrova foot pedal is also made from a high impact resistant composite material that does well at resisting warping and flexing that is common with foot pedals. It is a heel and toe control, and you can control most of the features that come with the Terrova right from the pedal. Included controls that are on the foot pedal are a momentary on button, which we advise for when in manual use. There is also a constant on, an auto-pilot on (for models that come with auto-pilot), a spot lock button, and an infinite variable speed dial. We also like the left and right steer buttons located below the heel guard. When using some of the software options for the autopilot, these directional buttons allow you to make adjustments when needed as the motor and GPS cannot always account for obstacles that might be present. Overall, the foot pedal gives you incredible and sensitive control over the motor direction as well as changes to the speed setting. There is no lag time between pressure out on the toe or heel and movement of the motor. As far as the motor goes, it features all of the technology that Minn Kota has been developing over the last decade, so it runs smoothly and quietly. You also get the added benefit of the digital variable speed control giving you more control at your fingertips and better battery life. And that goes for the 55, 80, and 112lb thrust model options. A similar trolling motor to the Terrova from the Minn Kota line is the Minn Kota Ulterra. Both the Ulterra and the Terrova have similar thrust options for their different models, though the Ulterra does not have a 55lb thrust option. Both also come with the options for the i-Pilot or i-Pilot link as well as an integrated sonar. Some of the biggest differences, regarding features between these models, are the auto stow and deploy, power trim, and a newly integrated battery meter in the i-Pilot remote. As far as performance goes, both of these motors are going to run well and should last a long time on the water. The competition also has a trolling motor that competes with the Minn Kota Terrova in sales, and that is the MotorGuide X5. There are a lot of similarities between these two trolling motor. Like the Terrova, the X5 features a solid base mount made from high-grade material. It uses digital variable speed control and features extreme sensitivity in control and speed settings with its foot pedal. All models of the X5 come with a lighted directional indicator but not with a battery power indicator as the Terrova does. Perhaps the biggest difference between the two is the number of model options. The X5 has a lot more options than the Terrova, though their highest peak thrust model is at 105lb rather than 112lb in the Terrova. Probably not a huge difference but it is there. We also think the Terrova has a little bit of an edge a far as ease in stowing and deploying go. For the more serious anglers, the Minn Kota Terrova bow mount trolling motor is going to be tough to top. From its durability to its excellent direction and speed control there is little left wanting. It features the newest advancements in the i-Pilot software and just about every feature that is wanted on a trolling motor including list assist technology that make stowing and deploying easy. There is no doubt in our minds that the Minn Kota Terrova is more than deserving of its A+ rating.